Saxco International, LLC is the leading provider of rigid packaging solutions to the wine, beer, liquor and food industries in North America. Our expertise includes bottle design, product sourcing, decorating, project management and delivery whether you are looking for a one-stop-shop or a single item for your premium package. Our world class partners including North American manufacturing partners Ardagh and Owens Illinois and our globally sourced Saxco Private Label, allow us to deliver both cost effective stock solutions as well as completely customized packaging. and our multiple stocking locations allow us to get your products to you when you need it! Saxco International, LLC is headquartered in suburban Philadelphia, Pennsylvania, with sales offices in Napa and Concord, California; Vancouver, Washington; Longmont, Colorado; Louisville, Kentucky; Mountainside, New Jersey; Tampa, Florida; Ontario, Canada; Qingdao, China. Colors shown are subject to your computer and monitor resolution, and may vary from bottle to bottleplease request a sample to verify actual color. Not all products are stocked some require long lead times. Check for availability. If you don't see what you need, call us to find it or create a custom solution. Contact us today for custom solutions. Our leadership team has over 100 combined years in the industry and many of us have led the way in modern packaging distribution. You can be sure we'll help provide what you need. Our booth at the Unified Wine & Grape Symposium features the latest selection of glass, metal and plastic containers from top manufacturers around the world. We will also feature our new line of Saxco Select Plus ultra premium corks allowing visitors to choose the perfect combination of bottle and closure. Our packaging experts will also be there to answer all your questions, and help you select the best packaging solutions for your brand. We look forward to seeing you at our booth 1016. January 4, 2019 GREENWICH, Conn. — Atlas Holdings LLC announced today that it has acquired Saxco International, LLC (“Saxco”), the leading North American value-added distributor of rigid packaging to the wine, spirits, craft beer, and food markets. Saxco offers a broad range of products and services including glass, metal, and plastic containers, capsules, closures, custom packaging and mold development. Terms of the transaction were not disclosed. Saxco was founded in 1936 and led for many years by Herb and Keith Sachs before being acquired by The Sterling Group in 2010. Today, the company’s dedicated professionals serve a loyal customer base of more than 5,000 wineries, distillers, brewers and specialty food manufacturers across North America. These customers include some of the premier beverage brands in the world. Saxco’s broad product line and distribution capabilities are complemented by a differentiated suite of other services, from brand and packaging design to warehouse and logistics management. Its expertise in glass, for example, is a clear differentiator compared to the other large distributors. Saxco International, LLC, “Your clear choice for premium packaging solutions” has more than 80 years of industry experience providing a broad range of packaging products and services to the wine, spirits, craft beer and food industries. It offers a broad range of rigid packaging products including glass, metal, and plastic containers, capsules, closures, custom packaging and mold development. Headquartered in Concord, California, it has over 250 associates and more than a dozen customer support and fulfillment centers throughout the United States, Canada and China. For additional information, please visit www.saxco.com. Headquartered in Greenwich, Connecticut and founded in 2002, Atlas and its affiliates own and operate 17 platform companies which employ more than 21,000 associates at more than 200 facilities worldwide. Atlas operates in sectors such as aluminum processing, automotive, building materials, capital equipment, construction services, paper and packaging, power generation, pulp, supply chain management and wood products. Atlas’ companies together generate more than $5 billion dollars in revenues annually. For additional information, please visit www.atlasholdingsllc.com. The inspiration behind Boony Doon Vineyard’s wine in a can La Bulle-Moose was a bit of an iterative process. First, decisions had to be made on the brand name and how it would tie into their brand legacy. After rounds of discussions they decided to tie into their existing “Cigare” brand because the wine is in fact made from 100% Rhône varieties. Bulle is French for “bubble” and it was only a matter of time before the words Bulle and Mousse were conjoined by the Bonny Doon Proprietor, Randall Grahm. The team at BDV finally agreed on the name La Bulle-Moose and felt it was a great representation of the product inside the can. Randall shares that he always greatly resisted the idea of “critter wines,” and swore he would never have a critter on the label of a BDV product, but when Chuck House, BDV’s package designer, showed him the iconic bull moose on the can, he was sold. It really seemed to stand out on a shelf (maybe it’s the vibrant pink color). When choosing a can supplier, BDV’s packaging team needed flexibility and responsiveness to accommodate the evolving lead times and volume fluctuations while hitting critical production and quality deadlines. Saxco sales representative Mario Guerra stepped in with the perfect hybrid solution of sleeved cans, just-in-time delivery programs, and inventory management solutions – all geared toward insuring BVD hit each key business objectives with the launch of La Bulle-Moose. With the immediate success of La Bulle-Moose, Randall now agrees cans are a natural container for lower pressure fizzy beverages, as far as convenience and lower carbon footprint. It is also not entirely lost on Randall that BDV can benefit from gaining visibility among a younger demographic, and it is possible that wine in cans might well accomplish that. What’s next for Bonny Doon? Randall shares,” We have certainly had our share of wacky packages/labels over the years; the job in the future will be to somehow convey through the high artistic standards of the package the equivalent level of fastidiousness/gravitas that has gone into the production of the wine itself.” Through the lens of this wine industry innovator, we can all look forward to a bright and bubbly future in wine packaging, and Saxco will be the partner to help insure his visions become a reality. Saxco gives you all the choices you need to pour the same care and expertise into your packaging as you do for your vintages. A trusted and sophisticated wine market partner, Saxco can cultivate your brand to stand out on the shelf. Options range from high-end, differentiated packages to cost-leading standard designs. No matter the package, Saxco experts will work with you to understand your needs and match our operational capabilities to your supply chain requirements. Saxco market experience: boutique, mid-market Estate, negotiant, and commercial wineries. Saxco has added barrels, corks, and zorks to our product portfolio. Available from Brick Packaging, a Saxco International Company. Moving to upgrade the image of its premium Farm-Crafted Potato Vodka, Beattie’s Distillery, of Alliston, Ontario in Canada is refreshing its packaging with a bold new look. To help create the innovative and dynamic new packaging for its popular premium spirit, it called upon Saxco Canada, of Oakville, Ontario, worldwide packaging specialists for the wine, spirits, beer and food industries and its global resource network to assist with the project. Saxco Canada is a division of Saxco International, LLC, of Horsham, PA.
Halle worked closely with Liz Beattie, Chief Operating Officer of Beattie’s Distillery and its in house graphics design and product team to bring the new package into the Canadian marketplace. To move the project forward, Saxco Canada sourced and supplied a high quality 750 ML private mold tapered flint bottle with a medium neck, rounded shoulders and a thick bottom from a high end, reliable overseas resource partner. The Beattie’s name was embossed in the front of the bottle. Saxco also provided an attractive walnut colored wood top synthetic cork assembly from one of its time tested European supply sources. In addition, the packaging specialty company also sourced and supplied a decorative hang tag which over-fitted the neck adding to the bottle’s overall eye catching appeal. Beattie’s provided a multi-colored front label accented in black, red and green type and a colorful tamper evident seal to finish off the refreshed new package. The labels and tamper evident seals were sourced through ASL of Vaughan, Ontario. The Beattie’s premium Farm-Crafted Potato Vodka is 40-percent Alcohol By Volume and is being distributed in Ontario, Manitoba, Alberta and New Brunswick in Canada. Cost for a 750 Ml size is $34.95 (Canadian dollars). For additional Information, call Beattie’s Distillery at 705-434-7840 or visit them on the web at www.beattiesdistillers.com. Saxco Canada is located at 2360 Cornwall Road, Oakville, Ontario Canada and may be reached at 1-905-271-5700. About Saxco International : Saxco International, LLC, “Your clear choice for premium packaging solutions,” has more than 30 years of industry experience, providing a broad range of packaging products and services to the liquor, wine, beer and food industries. The company’s products and services include expert consultation from design to development, as well as customized services for packing. Saxco is headquartered in suburban Philadelphia, Pennsylvania with offices and warehouses in Louisville, Kentucky, Concord and Napa, California, Portland, Oregon, Toronto, Ontario, Atlanta, Georgia, Norfolk, Virginia, Cincinnati, Ohio, Mountainside, New Jersey, Statesville, North Carolina, Carlisle, Pennsylvania, Traverse City, Michigan, Denver, Colorado and Qingdao, China. For additional information call 215-443-8100, fax 215-443-8370 or on the web at www.saxco.com. Ragged Branch Whiskey, of Charlottesville, Virginia is introducing its new premium Virginia Straight Bourbon Wheat and Rye Whiskeys to American whiskey drinkers in the Virginia area marketplace. To assist with the all-important packaging component for its new premium spirits, it brought Saxco International, LCC, of Horsham, PA, worldwide packaging specialists for the wine, spirits, beer and food industries and its vast global resource network into the mix. “Our role was to help create a distinctive and innovative package with beautiful overall eye appeal and a stand out shelf presence and complete the project within the pre-stated time and budget parameters,” states Christian Maute, Mid-Atlantic sales manager for Saxco International. Maute and Nina Leshyk, Saxco’s digital design specialist worked closely with Alex Toomy, principal of Ragged Branch Whiskey and his design team to help move the project from initial design phase to market ready reality. To move the project along, Saxco sourced and supplied a quality private mold 750 ML flint cylindrical bottle with a taper, long neck with fluting half way up and a thick bottom. The bottle came from a long time reliable overseas supply source in Saxco’s global network. The packaging design specialty company also sourced and supplied attractive custom natural cork mahogany wood top assembly closures for both versions from a long associated quality supply partner in Portugal. In addition, Saxco supplied custom capsules which over fitted the cork assemblies, green for the rye and red for the wheat version from a vendor in France. Both were imprinted with black lettering. The bottles were finished off with custom black, red and gold labels with white lettering which were created by Rugged Branch Whiskey’s graphic designer, Tia Baker and produced and supplied by John Napotnik of ID Technology, a North American supply source. HORSHAM, PA (October 5, 2016) - Saxco International, LLC announced here today that it has acquired Brick Packaging Corporation, of Traverse City, MI. Saxco International is a market leader in the distribution of rigid packaging for the liquor, wine, beer and food industries. Saxco’s partnerships with North American manufacturers and unparalleled sourcing capabilities result in a wide array of customized glass, plastic and closure packaging solutions for its customers. Brick Packaging Corporation is built on its ability to cater to the wine industry by anticipating and meeting its customers’ packaging requirements. The packaging distribution specialty company is founded on the principles of quality, integrity and customer service and works to fulfill packaging needs efficiently, effectively and within budget and time parameters. Brick Packaging also specializes in offering custom solutions for out of the ordinary and specialty product runs. Financial details of the acquisition remain confidential. Saxco International, LLC, “Your clear choice for premium packaging solutions,” has more than 30 years of industry experience, providing a broad range of packaging products and services to the liquor, wine, beer and food industries. The company’s products and services include expert consultation from design to development, as well as customized services for packing. Saxco is headquartered in suburban Philadelphia, Pennsylvania with offices and warehouses in Louisville, Kentucky, Concord and Napa, California, Portland, Oregon, Tampa, Florida, Toronto, Ontario, Cincinnati, Ohio, Mountainside, New Jersey, Statesville, North Carolina, Carlisle, Pennsylvania, Grand Rapids, Michigan, Denver, Colorado and Qingdao, China. For additional information call 215-443-8100, fax 215-443-8370 or on the web at www.saxco.com. Kevin Brownrigg has been appointed as a regional sales manager for Saxco International, LLC, it was announced here today by Rob Belke, vice president of sales. He will be directly responsible for the day-to-day sales functions and new business development for Saxco customers in the beer, wine, spirits and food industries located in the Midwestern region of the United States. Brownrigg joins Saxco International with almost 30 years of experience in sales, marketing and technical services with a strong working knowledge of the packaging industry from package and product development to manufacturing efficiency and filling line operations. His most recent position was as a consultant for Act International in Ormond Beach, FL consulting for packaging and start-up companies. Prior to that he served as director of business development for Pelliconi in Orlando, FL covering the United States, Canada and the Caribbean regions working with crowns and other closures for the craft beer and beverage markets. Before that, he was head of new business development responsible for closure sales to Coca Cola in the United States, Canada and Latin America for Obrist Americas in Ormond Beach, FL. In addition, he was previously employed as a senior regional account manager for Owens-Illinois/Graham Packaging in Ormond Beach, FL, and senior account manager and manager of product performance/technical sales for Constar Plastics in Philadelphia, PA.
Brownrigg received a bachelor’s of arts degree in communications from the University of Central Florida in Orlando. Rick Schwartz has been appointed as Senior Vice President/General Manager for all product lines for the East Coast and Canadian regions for Saxco International, LLC, it was announced today. A top executive, with more than 30 years of business experience in sales, marketing, e-business services, purchasing and operations, he will be directly responsible for the overall management of the East Coast United States and Canadian regions encompassing all product lines of the world-wide packaging specialty company serving the wine, spirits, beer and food packaging industries. His responsibilities will include the total profit and loss for both regions, as well as the management and supervision of sales and marketing, operations and purchasing functions. Prior to being appointed at Saxco International, he was employed for 20 years in numerous executive capacities by VWR International, LLC, of Radnor, PA, a leading global provider of products, services and solutions to laboratory and production facilities in the pharmaceutical, biotechnology, industrial, education, government and healthcare industries with sales in excess of $4.3 billion. His most recent position was as Vice President of Business Development. Before that, he served as Vice President, General Manager, Service and Vice President of Sales Operations, Vice President of Global Accounts and Vice President of e-Business. He holds a bachelor of arts degree from Miami University in Oxford, Ohio and completed a Strategic & Timely Decision Making Program at the Wharton Business School of the University of Pennsylvania. He also participated in business development courses at Baxter Management Institute, the Center For Service Leadership Council at Arizona State University and the Lean Six Sigma Executive Review at GENEDGE (Virginia Tech University). He is a resident of Phoenixville, Pennsylvania. 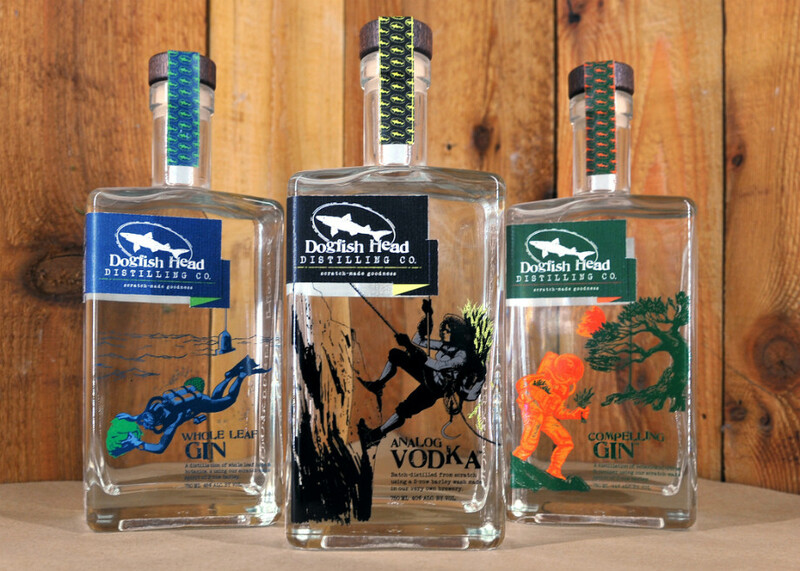 Utilizing new American-made copper stills, an overall handcrafted characteristic approach and veteran Master Distiller Graham Hamblett, Dogfish Head Distilling Co., of Milton, Delaware is expanding its scratch-made spirits line with the introduction of Dogfish Head Analog Vodka™, Dogfish Head Compelling Gin™ and Dogfish Head Whole Leaf Gin™. To help create a unique and beautiful package which would be commensurate with the quality taste and rich goodness of its new premium vodka and gins, it called upon Saxco International, LLC, of Horsham, PA, world-wide packaging specialists for the wine, spirits, beer and food industries and its vast global resource network to assist. “Our role was to help create an attractive and colorful new package that would also deliver a bold and distinctive shelf appearance and bring the project to fruition within the required timeline and budget parameters, “says Christian Maute, Saxco’s Mid-Atlantic sales manager, who coordinated with Saxco’s Eric Guli, project manager of supply chain on the Dogfish Head Distilling spirits project. Saxco’s Product Designer Nina Leshyk also worked with Maute and Guli on the project. Moving the project forward working closely with the Dogfish Head Distilling Co.’s design and marketing team, Saxco helped to create a high quality private mold square shaped flint 750 ML bottle for the three new spirits with flat shoulders and a premium thick glass base. Saxco then provided a reliable time-tested overseas source to produce the bottle which incorporates a prominent embossed Dogfish Head logo on its right hand side. The glass manufacturer also completed the heat applied unique two-color pictorial graphics on the front of the bottles. These concepts and designs were done by Dogfish Head Lead Designer Tim Parrott. Parrott also provided the graphic designs for the pressure sensitive two color labels which are applied above the heat applied graphics. The bottle was finished off with a Mahogany wood top synthetic cork which was over-fitted with a tamper evident tax stripe. Dogfish Head’s new state-of-the-art distillery in in the heart of its Milton, DE campus, gives Head Distiller Graham Hamblett access to the same quality ingredients, brewing expertise and equipment used to make Dogfish Head off-centered ales. At the heart of the distilling operation are two 500-gallon copper stripping stills and a 250-gallon copper vodka column sourced from fourth-generation custom fabricator Vendome Copper & Brass Works in Louisville, Kentucky. The first spirits to debut with the off-centered approach are Dogfish Head Analog Vodka, Dogfish Head Compelling Gin and Whole Leaf Gin. Made with 100 percent brewers malt and proprietary “Doggie” yeast, Analog Vodka is 80-proof and embodies Dogfish Head’s 20-year commitment to quality and creativity. It’s crisp, with viscous sweetness of caramelized sugar, malted barley with cleaning minerality, a sipping vodka for whiskey drinkers. Suggested retail price is $32.99 for the 750 ML size. Dogfish Head Compelling Gin is 88-proof and is distilled using the peel and flesh of citrus and a long list of culinary ingredients stolen from the Dogfish Head brewpub kitchen. Compelling Gin is bright and citrusy, with a crisp juniper snap and lingering cinnamon warmth, a culinary inspired gin. Suggested retail price is $36.99 for the 750 ML size. Dogfish Head Whole Leaf Gin is 90 proof and continually doses whole-leaf hops into each step of the gin distillation process. This is an earthy gin with a drying coolness, yet bursting with floral hop goodness, the IPA of spirits. Suggested retail price is $38.99 for the 750 ML size. “What we’re seeing is that consumers are looking for the same ‘goodness’ out of their craft spirits that have led them to explore craft beer,” says Dogfish Head Distillery Manager James Montero. “They want a high-quality distilled spirit and an honest authentic approach wrapped in an interesting story.” Currently available in Delaware, the new spirits will soon be introduced in several Mid-Atlantic states. For additional information, contact Dogfish Head Distilling Co. at 302-684-1000 or visit them on the web at www.dogfish.com. Saxco International, LLC today announced that it has acquired Square Peg Packaging and Printing, LLC. Saxco is the market leader in the distribution of rigid packaging for the liquor wine and beer industries. Saxco’s partnerships with North American manufacturers and unparalleled sourcing capabilities result in a wide array of customized glass, plastic and closure packaging solutions for their customers. Square Peg Packaging and Printing, LLC designs and supplies glass containers and a variety of customized packaging materials and commercial printing. Square Peg’s products serve the brewing and beverage, electronics, food processing, pharmaceuticals, cosmetics and general manufacturing industries. The company also provides value added services such as assembly, kitting, contract packaging, design and prototyping. Square Peg delivers innovative marketing ideas and specializes in improving brand differentiation and consistency for its clients. Founded in 2007, the company has been listed on the national Inc Magazine Fastest Growing Private Companies list for the past four years and operates facilities in San Diego, CA and Phoenix, AZ. Financial details of this acquisition remain confidential. With harvest here (or soon to begin), your friends at Synergy wish you the very best at this busy time. The WD750-10 is a 750ml Burgundy style bottle in Antique Green with a full punt and cork finish. This bottle is typically used for Syrah, and Pinot Noir. The YT2149 is a 375ml Burgundy style bottle in Antique Green with a full punt and cork finish. This bottle is typically used for Syrah, Pinot Noir and late harvest red wines. It can also be used for olive oil. The WD750-19 is a 750ml tapered, Claret style bottle in Flint with a full punt and cork finish. This bottle could be used for Sauvignon Blanc, and rose wines. All advertised products have limited supply and may not be available in the future. All sales final. Please discuss your requirements with our friendly and knowledgable customer service persons. BENICIA, CA, JANUARY 20, 2012:Synergy Glass & Packaging, Inc.,sponsored their first charitable drive this December by donating a portion of the proceeds from new orders to two local food banks; the Napa Valley Food Bank in Napa, and theRedwood Empire Food Bank in Santa Rosa. Synergy Glass & Packagingis a localdistributor of fine quality wine bottles and decided to combine their products with the generosity of their customers to ultimately provide cash donations to local Food Banks. Due to an openhanded response of many existing customers as well as new friends, each Food Bank received a check above the projected goals. Look for future campaigns from Synergy Glass &Packaging. These local food banks work with the community and local businesses in order to share the bounty of this richly abundant area and meet the needs of their many local residents. Their clientele vary in age from birth to seniors and are served by an array of programs to ensure they receive a variety of nutritious products. The representatives of the Food Banks remind all of the need for donations outside of the popular Holiday Seasons. People are hungry every day. While food is gladly accepted and needed, the Food Banks’ buying power is around 4 times that of the general public. Cash donations benefit their pantries greatly, especially during the current economy. Even the lush wine country has ‘invisible’ populations of hungry children, the working poor, the out-of-work needy and the growing senior populations.The Synergy Glass & Packaging Companyfamily is looking forwardto donating time at the facilities and continuing to develop successful future campaigns with their customers. Vaina Wang, CEO of Synergy Glass & Packaging, and Shari Boulden, Operations Manager of Synergy Glass & Packaging, flank Shirley King, Program Director of the Napa Valley Food Bank (holding donation check). Gabrielle Chretien, Sales Representative for Synergy Glass & Packaging, presents a contribution check to Billy Bartz, Food Drive Coordinator for Redwood Empire Food Bank in Santa Rosa. Large format bottles, and end of line specials!! !